History of the buses of Miskolc | MVK Zrt. The current transportation systems of the greatest cities all over the world are based not only on trams but also other highly developed transportation technologies. Miskolc, however, is only home to buses apart from trams. The first benzene engine-driven vehicle appeared on the streets of the city in 1897, the same year when the first tram was launched. Nonetheless, the number of automobiles only started to increase after World War I. Our city can boast to be the first one to launch a scheduled bus service in Hungary, on 8 June 1903. Passengers were transported by 8-seater cars. rams were, however, so popular at the time that they were preferred over any other means of transport. The foundations of a modern city bus service were laid down by private entrepreneur Géza Siposs. He petitioned the city government in 1925 to allow him to set up a public transportation company that would suit the requirements of passengers to the fullest. The administrative authority rejected the application. In 1926, Miskolci Villamossági Rt. launched bus services to Tapolca and Lillafüred. The terminal of the buses to Tapolca was by the Hejőcsaba tram terminal at first, then at the Mindszenti church. The Lillafüred bus line joined the tram near the reformed church in Diósgyőr. These buses were the first to frequent back-streets, and demonstrated convincingly that buses can play an important role in the traffic of the inner city, and what is more, can be serious competitors of trams. Line 6, launched in 1952, travelled between Városház Square and Pereces. In the same year, Line 7 was launched starting from Dózsa György Road, connecting the nearby village of Felsőzsolca to the transportation network of Miskolc. The main line, labelled Line 1 also travelled to the Ironworks. On 1 January 1953, number 2 was given to the line between the Rotating Bridge and Tapolca. The first buses went to Szirmabesenyő from the Rotating Bridge (4/A) in 1954, and to Kistokaj in 1955. Thanks to the intensive development of local transportation, new lines were opened, terminating in Komlóstető, Vargahegy, Martin Estate, Zsarnai Estate, and Ómassa. To get an idea of the expansion of bus services, consider that the number of passengers nearly quadrupled between 1954 and 1963, from 10.3 million to 39.7 million. In 1954, in the year of unification with the tram, a total of 51 buses ran on 8 lines, and by 1963, 112 buses transported passengers along 14 lines. In the 1960’s, Line 4 was extended to go as far as the airport junction, and Line 4/A was launched between Airport Junction and the Cement Factory, and Line 4/B between Airport Junction and University Town. Line 10 was also extended, so starting from Dózsa György Street it then went as far as the Zsarnai Estate. Also starting from the terminus in Dózsa György Street were Line 9, stopping at the Ironworks and terminating at the Heavy Machine Tool Factory. Line 8 connected Béke Square and the Cold Storage. Line 2/a was added to supplement the buses terminating in Tapolca. 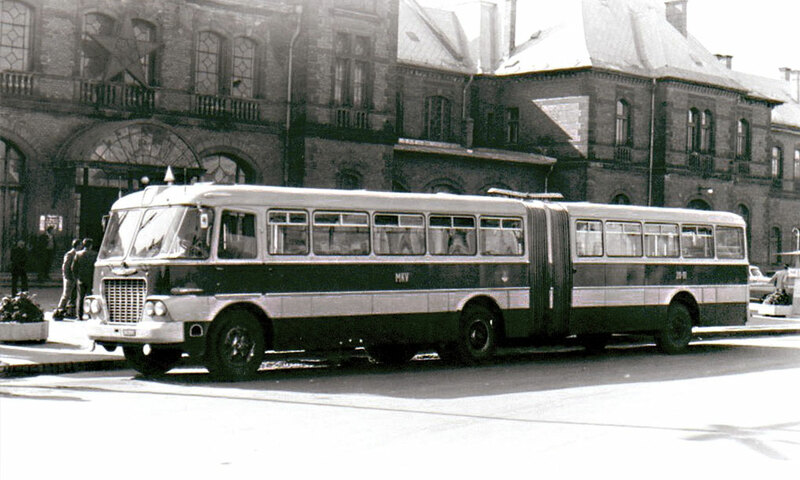 In 1966, several Ikarus 31 buses, originally manufactured as long-distance coaches, were replaced by Ikarus 620 buses that suited the requirements of city transport better. In 1964 and ‘65, modern termini were built at Béke Square and the airport, which satisfied all traffic and technical requirements. Most of the cross-city lines were shortened and modified to fit the new termini. In 1967, line numbers were changed: the buses starting from the terminus at the airport were renumbered 12 and 14 from 4/A and 4/B, respectively, and buses number 2, 2A, 3, 3/A, 4, 7, 8 and 10 terminated at Búza Square from then on. The terminal at Dózsa György Street was eliminated. The buses that used to start from here were relocated to Búza Square and the new junction at Marx Square. Lines 5, 6, 9, 16, and 19 terminated here. In accordance with the new transportation policy concept approved of in 1968, passenger transportation was discontinued in early 1971 on the narrow-lane industrial railway. To service the miners travelling there, a new bus numbered 16 was launched from the terminal at Marx Square. The single-track Tatárdomb tram (Nr. 4) was discontinued on 15 January 1976, and replaced by a branch line (9/Y), travelling between Marx Square and Iván Street. Miskolc Transportation Company received a government grant of HUF 120 million, which was used between 1972 and 1974 to purchase new vehicles and technological equipment as well as to complete the investment projects at the central site. By eliminating the obsolete and scattered workplaces at other sites, the activities of Miskolc Transportation Company became more organised and efficient, resulting in dynamic development in the decade and a half to follow. In 1985, transportation performance was 221.5% of the level in 1970. The primary objectives were to reduce the crowdedness of buses and the time spent travelling, to modernise the network and to improve geographical coverage. This was the time when new lines were launched either to connect so far unserviced areas (Lines 17 and 69) or to reduce crowdedness in others (7/A). In construction phases I and II of the Avas Residential Estate, the new demand was satisfied by launching Lines 31, 32, 33, and 33/A, and faster access was ensured by launching shuttle buses nr. 102, 103, 104, 108, 121, and 133. The primary way of reducing crowdedness is to increase capacities, therefore the company accelerated the reconstruction of buses. Obsolete vehicles with too few seats were discarded two years before the scheduled deadline, in 1978. Ikarus 620 buses travelled last along lines 3, 15, 23, and 32, while the last Ikarus 180 buses were nr. 1 and 1/D. The newly commissioned Ikarus 260 single buses had 20% more capacity than the old ones. Another effective way of reducing crowdedness was to increase the number of articulated buses from 35 to 90, and increasing the ratio of bendy cars from 23.4% to 42.8%. Between 1975 and 1980, the fleet of the transportation company was expanded by 230 new buses. In the early 1980’s, a substantial number of ticket vending machines were installed, along with modern, so far unseen digital display passenger information boards and starting devices. In the meantime, the number of articulated buses kept increasing in response to the ever growing demand. In 1980, some 170 million passengers travelled by bus in the city. A new road, named after Ottó Korvin was opened in 1978 in the inner city, which made it necessary to reorganise traffic along the north-south backbone line between Petőfi Square and People’s Park. The new, modern terminal in Mayfair Park was opened on 2 January 1979 to support the east- west backbone line. The terminal of buses nr. 5 and 15 was relocated from Marx Square to Mayfair Park, and Line 1 buses ran more frequently along the abandoned section. In 1981, Lines 35, 36 and 31 were extended to go as far as Avas Lookout. The route of Line 32 was first changed in 1982, and then in 1985, so as to provide a no-change connection between Avas Lookout and the new terminal at Gömör Railway Station. In 1983, the inner terminal of Line 11 was also moved to Gömör Railway Station. In order to better service the outer areas, Line 69 was extended, and a new line (55) was launched between Mayfair Park and Coppice. As a result of a change in administrative borders, intercity (Volán) buses were replaced by Line 68 to service the village of Bükkszentlászló. The line of Bus 14 was extended through Hejőcsaba to as far as Farkas Antal Road. Some line modifications were also performed; Buses 24 and 32 were relocated to Vándor Sándor Street, and Buses 21 and 121 were redirected to their original route on Vörösmarty Road. Szabadságharc Street was reconstructed to be suitable for bus traffic, and Buses 35 and 38 still travel this way, although Buses 34 and 133 no longer do. A number of unexploited shuttle buses were terminated and basic lines made more frequent, including Line 108 in 1981, Line 103 and 105 in 1983, and Line 133 in 1984 (which was replaced by Line 36) as well as Lines 104 and 7/A in 1985. In an effort to reduce crowdedness, articulated buses were launched in 1982 on Lines 4 and 31, in 1983 on Lines 21 and 121, and in the next year on Line 8. With effect on 1 February 1984, the bus network of the city was modified fundamentally, since through traffic was banned on the inner city section of the east-west main road, and buses were redirected to relieving roads. The new and modern building of the Avas Lookout terminal was opened, and the next summer bus drivers could move in to the new terminal at Tisza Railway Station. By then, buses carried 198.7 million passengers a year. Miskolc Transportation Company had a total of 262 buses at the time. By 1988, some new lines had been launched (18, 37, and 67), less utilised ones terminated (1/D and 55). It was at the same time that vehicle advertising, commenced in 1987, started to boom. Between 1990 and 1992, the articulated buses previously serving Lines 4 and 24 were moved to Line 3 and, during the summer, to Line 16, and were replaced by single buses. As its utilisation was decreasing, Line 33 also ran with single buses from then on. The discontinued Line 69 was replaced by dividing the buses serving Line 1 and launching Line 1/A in an effort to help the then unserviced areas. From the second half of 1992, in an effort to further reduce capacity kilometres and costs, several lines (1, 101, 12, 14) were served by single buses on weekends and holidays.